The primary towns in this region are San Ignacio and Santa Elena. A variety of charming smaller villages are scattered around the region. The notable Mennonite agricultural community of Spanish Lookout is also in the Cayo. Expats can find plenty of pristine, undeveloped property in this district, up for the taking. 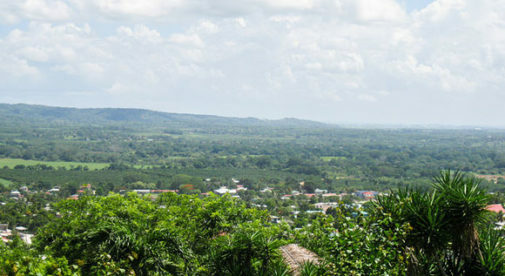 The fertile Cayo is the bread basket of Belize. It’s also an eco-tourism wonderland. This region is abundant with exotic birds, indigenous creatures, vibrant flowers and magnificent trees. Belize’s most desirable hardwood trees—mahogany, zericote and rosewood—thrive in the Cayo. So leave your old furniture behind. If you move to Belize you can hire a local artisan to craft quality handmade furniture for you, from gorgeous local woods. The cost is surprisingly affordable, especially when compared to prices for mass produced retail furniture. The Cayo’s expat community is vibrant and active. Some expats live in the twin towns of San Ignacio and Santa Elena. Others gravitate to regional villages, such as Bullet Tree or Cristo Rey. And there are those who prefer to live out of sight, off the grid. Friends of ours recently moved into an off-the-grid home they built, on the Belize River. They are thrilled to be living in a pre-planned ruralist community, with like-minded neighbors. Another plus—land and properties in the Cayo are reasonably priced. At this time a two-bedroom, one-bath home with a loft is on offer for $135,000. The house sits high on a hill in a San Ignacio Town neighborhood, on a ½-acre lot. It has a stunning view of the area. The Cayo lifestyle tends to be relaxed and laid back. Going to the market on Saturday is one of the week’s big events. But there are plenty of outdoor activities—such as touring Maya ruins, caves and waterfalls, hiking, canoeing, horseback riding, etc. These activities are within an easy drive for a day trip. Expats find plenty of options for socializing here. Favorite hangouts include restaurants like Mr. Greedy’s, Hode’s Place and Flayva’s, in San Ignacio Town. Volunteering is another way to integrate into the community. Some expats actively participate in the local Rotary Club. The Cayo Connections Women’s Group meets monthly for lunch. And a number of Facebook page groups meet regularly. This region is known for its Maya ruins, culture and healing arts. So it’s not surprising that health-conscious expats are attracted to this region. The area’s fertile jungles are rich with herbs and plants Maya shamans have used for over a millennium to heal their neighbors. But yoga and fitness classes are also now offered (at the San Ignacio Resort Hotel and Midas Resort). A new yoga and meditation ashram, the Chaya Garden Yoga Ashram, opened in Christo Rey in early 2013.